Out of stock since Wednesday, 19 October 2016. Due back soon. Active ingredient eprinomectin. In a convenient pour-on formulation, broad spectrum anthelmintic for the control of roundworms, lungworms, warbles, mange mites and lice on beef and dairy cattle. 21 days meat withdrawl. Nil milk withdrawl. POM-VPS. A pour-on solution containing 0.5% w/v eprinomectin for topical use in cattle. For treatment and control of gastrointestinal roundworms (including inhibited Ostertagia ostertagi and Cooperia spp. ), lungworms, warbles, sucking and biting lice, chorioptic and sarcoptic mange mites in beef and dairy cattle. For best results EPRINEX Pour-On for Beef and Dairy Cattle should be part of a programme to control both internal and external parasites of cattle based on the epidemiology of these parasites. Administer only by topical application at the dose rate of 1 ml per 10 kg bodyweight, corresponding to the recommended dose rate of 0.5mg eprinomectin per kg bodyweight. The product should be applied topically by pouring along the backline in a narrow strip extending from the withers to the tailhead. This product is formulated only for topical application to beef and dairy cattle, including lactating dairy cattle. Do not use in other animal species; avermectins can cause fatalities in dogs. Do not administer orally or by injection. To date no resistance to eprinomectin (a macrocyclic lactone) has been reported within the EU. However resistance to other macrocyclic lactones has been reported in parasite species in cattle within the EU. Therefore, use of this product should be based on local (regional, farm) epidemiological information about susceptibility of nematodes and recommendations on how to limit further selection for resistance to anthelmintics. Milk from cows may be used for human consumption at any time following treatment with EPRINEX Pour-On for Beef and Dairy Cattle. Studies have demonstrated a wide safety margin. Studies conducted at three times the recommended use level of 0.5 mg eprinomectin per kg bodyweight had no adverse effect on breeding performance of cows or bulls. EPRINEX Pour-On for Beef and Dairy Cattle may be used in dairy cattle during all stages of pregnancy and lactation. Studies have demonstrated a wide safety margin. Meat may only be taken for human consumption from 15 days after the last treatment. There is no milk withdrawal period for lactating dairy cattle. Milk from treated cows may be used for human consumption at any time following treatment with EPRINEX Pour-On for Beef and Dairy Cattle. Operators should wear rubber gloves when applying the product. If accidental skin contact occurs, wash the affected area immediately with soap and water. If accidental eye exposure occurs, flush eyes immediately with water. Should clothing become contaminated, remove as soon as possible and launder before re-use. In the event of ingestion, wash out mouth with water and seek medical advice. DANGEROUS TO FISH AND AQUATIC LIFE. Do not contaminate surface waters or ditches with the product or used container. Any unused veterinary medicinal product or waste materials derived from such veterinary medicinal products should be disposed of in accordance with local requirements. Rainfall at any time before or after treatment will not affect the efficacy of the product. No signs of toxicity appeared when 8-week old calves were treated at up to 5 times the therapeutic dose (i.e. 2.5 mg eprinomectin per kg bodyweight), 3 times at 7-day intervals. One calf treated once at 10 times the therapeutic dose (i.e. 5 mg per kg bodyweight) in the tolerance study showed transient mydriasis. There were no other adverse reactions to treatment. No antidote has been identified. 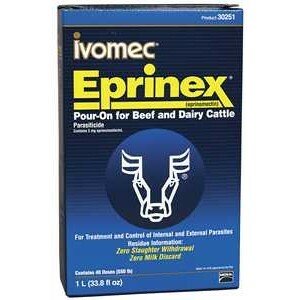 There are currently no questions for Ivomec Eprinex Wormers Pour On for Cattle - be the first to ask one!